NamFUN was created as part of the NamHR portfolio of services in order to address the ever increasing need for value added teambuilding events and corporate days. Our rule for any teambuilding event or corporate day is that it needs to be fun. It needs to tap into the creativity of the participants and the event should be a memorable one! Venue NamFUN will provide a venue for any event. Catering NamFUN will take care of all or part of your catering needs. This include food, drinks; tables, tents, cutlery etc. Transport NamFUN will transport your guests to and from the event. Branding clothing and novelties Namfun will provide you with branded clothing for participants and or branded novelties that can be utilized as prices or memorabilia of the event. Logistics We are confident that we will be able to assist you with any other logistic need that you may have. 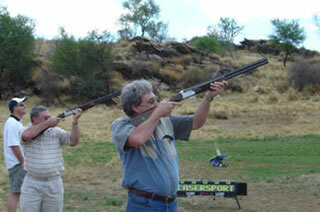 Lasersport clay pigeon shooting is a sport which can be enjoyed by everyone. The players use a modified shotgun to fire an infra-red beam at clays launched from a conventional clay launcher. Whenever a trigger is pulled, the Lasersport control module/scoreboard generates the shotgun ‘bang’ and when a player hits the target it reproduces the sound of a breaking clay. An indicator on the gun instantly tells the player whether he has hit or missed the target, and spectators and players can see the score of each player on the large electronic scoreboard. In each round of Lasersport up to 5 people can shoot at the same targets launched from a number of different positions at various speeds and angles. Several games, some easier than others, can be played. Whichever game you are playing, you score points when you hit the target. At the end of the competition the players who have scored the most points are the winners. High Technology Lasersport is played with authentic but de-activated 12-bore shotguns, each system having 5 Lasersport guns and a control module/digital scoreboard. Incorporated in the guns is a dedicated microchip which controls the infra-red beam fired by the guns. Each gun sends information to the control module, which reproduces the realistic ‘bang’ and works out the scores and displays them on its large integral scoreboard. 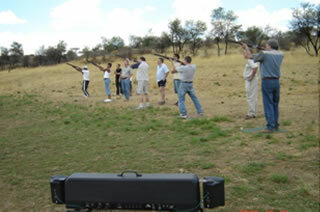 The total Shooting System can be played out of doors, during the daytime or at night. For use out of doors a minimum area of 30M x 10M is required to enable the clay to fly and land. Lasersport Clays Lasersport clays are supplied in 3 fluorescent colours for daytime shooting, and luminous clays are supplied for night use. Automatic Clay Launcher The Lasersport launcher holds up to 55 clays and has a built-in unit which charges the luminous clays. It can be adjusted to fire clays at different heights and angles, and clays are automatically launched each time a game is started. At Night The automatic launcher charges the luminous clays before launching them, and they create a bright green luminous path across the night sky. In addition, flash attachments are available for fitting to the Lasersport guns, and each time a clay is ‘hit’ both clay and gun will ‘flash’. Versatility The Lasersport system can be a permanent feature out of doors, or as the system will fit into a family car it can be moved easily from venue to venue, so that Lasersport can literally be played anytime, anywhere. Lasersport systems are operated at clubs, hotels, leisure centres, theme and amusement parks, pubs, cruise liners - anywhere people go for leisure and entertainment. Age Restriction Lasersport can be enjoyed by people of all ages but it is recommended that participants must at least be 11 years of age. It can be played just for fun or as a serious competition with people participating as individuals or as part of a team. As with any sport, there are different levels and classes of Lasersport enabling it to be played by everyone. 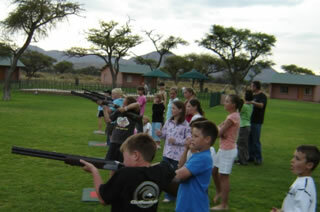 Green Lasersport is the only shooting sport you can enjoy knowing that there is absolutely no harm to the environment. Lasersport guns fire a harmless infra-red beam at re-usable clays - and even the sound is totally controllable. Total Safety Not only is Lasersport environmentally safe, but as the guns are deactivated there is no danger to participants or spectators, and even young children can play Lasersport in total safety. 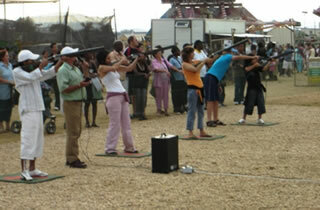 Lasersport Lasersport has become the most played shooting sport in many countries. Lasersport provides the opportunity for everyone to enjoy the thrill and excitement of shotgun shooting in perfect safety without any threat to the environment. Thousands of people play just for fun: others treat it as a serious and competitive sport. Game options 5 players/teams compete against each other. Every team can consist up to a maximum of 6 team members. This means that 30 people can compete against each other in 5 teams of 6 members each. In this game all 5 players are able to score if they hit the target. A hit with the first barrel scores 2 points. A hit with a second barrel scores 1 point. The player does not get 3 points if he hits with both barrels, even though he will see two green flashes from his hit/miss indicator. In this game only the first player to hit the target scores 2 points and no other player will score. The other players will still see the green flash if they hit the target, but they will not get any points. 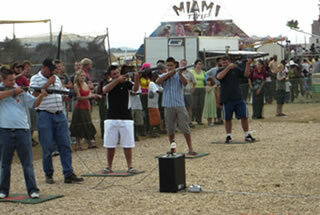 In this game all 5 players can score off BOTH barrels if they hit the target. They will get 2 points for a hit with the first barrel and 1 point for a hit with the second barrel. This time, if they hit with both barrels, then they will score 3 points. In this game the first 5 shots to hit the target scores and both barrels can count. All players may see a green hit light but only the fastest 5 shots will score. Barracuda™ System The Barracuda Paintball Laser Tag System is a lightweight, compact system suitable for even the youngest of players. The manufacturers have taken the popular Tippmann 98 Custom marker and converted it to a permanent infrared transmitter and receiver. This new system removes the need for C02 to operate while still using a real paintball marker. This is the perfect system for young players looking to be introduced to the sport of paintball/laser tag and for teambuilding events, corporate functions and competitions. Let players see how they stack up The Command Centre Module (CCM) simplifies game setup, start-up and management. When connected to any computer through a USB port, the CCM functions as a mini-server, tracking and broadcasting player hits, shots and kills in real-time. Quickly print game statistics, or automatically upload them to www.predatorgames.net, letting players see how they stack up against the best Paintball Laser Tag players around the world. Please contact us at lasersport@iway.na for bookings or additional information.